It should be around 62" x 80" (157 cm x 203 cm), but I haven't measured it. Everything fit, so that seemed good to me! I'd forgotten how much easier it is to assemble a quilt with sashing in between the blocks. Hardly any seams to match! To compare my layout with the inspiration quilt by Nettie Young, click here. Nettie made 15 blocks in a 3 x 5 layout. I developed my layout based on my memory of hers, rather than while looking at the photo. And every time I ended up with those two columns of dark cornerstones that she has, it seemed like a mistake. I thought it would be more balanced to have at least 3 cornerstones across the row. So that is why I increased the number of blocks to 24 in a 4 x 6 layout, and cut them down to 10" finished. The original 12" block, with the centre seams cut out and reassembled to 10"
I made 896 hourglasses for the original, all-hourglass plan. I still have at least 500 left. But, I am going to send them to the basement for at least a year! Hopefully some new idea for them will sprout after a good long rest. The first AHIQ challenge was for a Chinese Coins design, and I don't really consider this as a fit for that. I just liked the layout in the Nettie Young quilt. 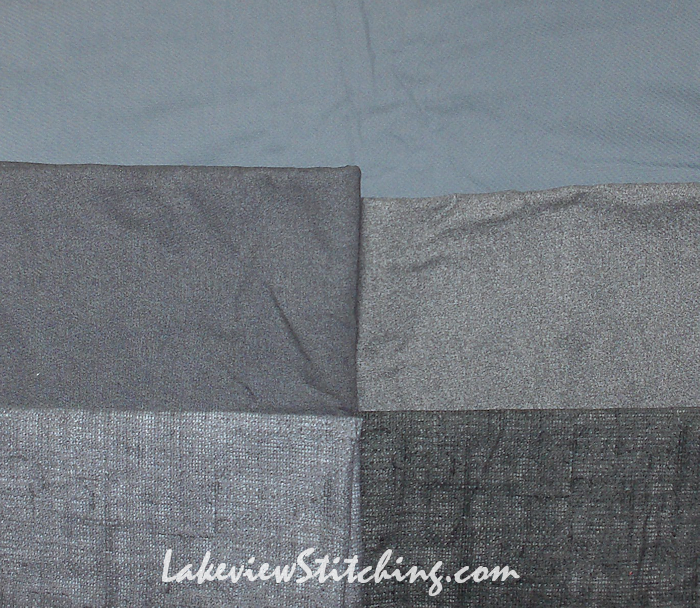 The second challenge is for a two block quilt, and I have a legitimate two block design planned. Is it improv if it's planned? I would say yes. 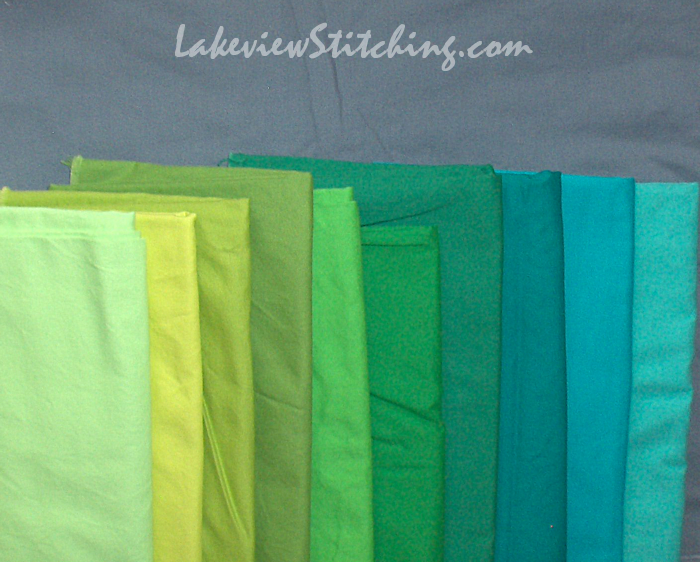 Solid fabrics in a range of turquoise and green. So, totally different. Stay tuned! 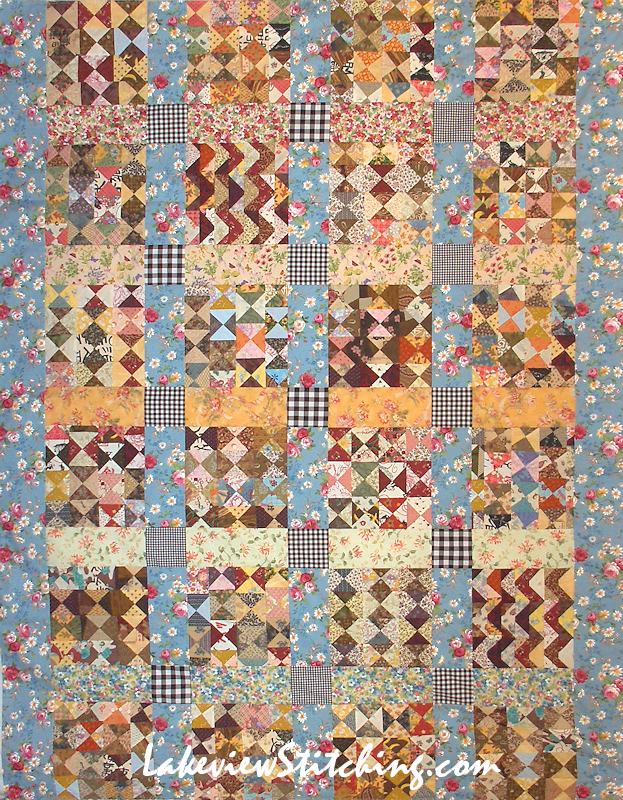 Oh, I love the look of this quilt - the retro color scheme and the casual piecing. Congratulations. I'm still working on my Nettie quilt but it will look nothing like this. And isn't it great that we call all come up with varied results from the same starting point? Thanks for your advice on the sashing. I forsee another sashed quilt in my near future. I too love this quilt! I take your point about the ease of putting this together with having all those seams to match. 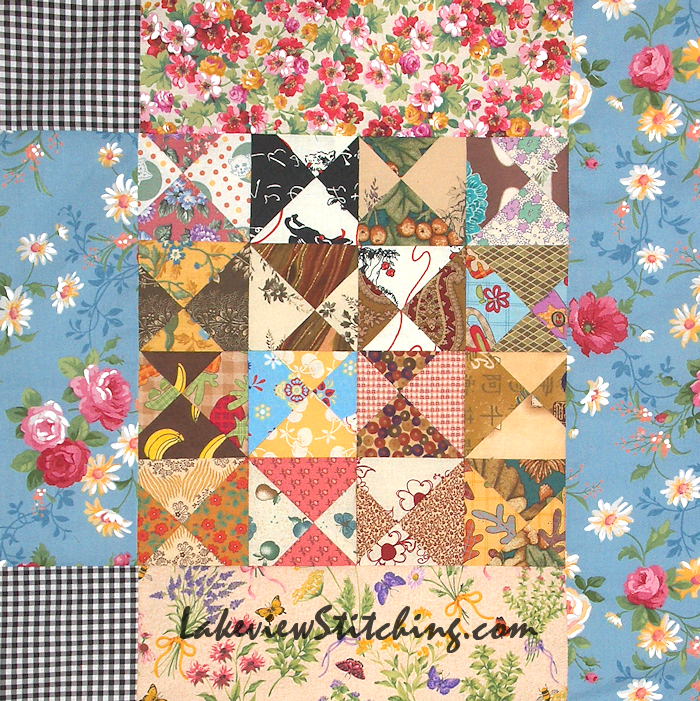 The fabrics you've used and the setting of the blocks are a delight! This is one lovely finish! 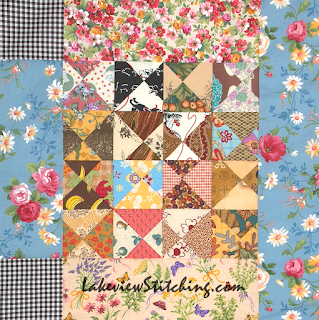 I love the colours you've combined here and the blue floral for sashing is perfect! Your Nettie finish is fantastic- so harmonious (again- you are so good at harmonious,). The new colour selection promises something really interesting. Thanks, Jillian! I'm not sure that harmonious is so elusive, actually. A lot more things go together than we realize sometimes. You frequently like the grey colour schemes you know! You should try one too for a change. I love this! So fun, sparky and unique! Your interpretation is absolutely wonderful. Great job! Way to go! 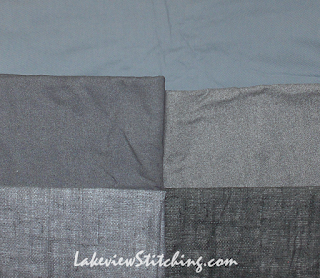 Using sashing does eliminate a whole bunch of seam matching. I laughed about your hour glass units "sprouting" into a good idea after a long rest! If only our projects could stitch themselves! I like your fabrics for your modern challenge. I look forward to seeing, "totally different!" Thanks, Terry! After so much delay, I am thrilled with how fast this came together at the end. It's not that I want them to stitch themselves exactly, it's that I want them to stop resisting! I can't tell you how much I love this - it is masterful. Your quilt is truly charming. Well, that turned out great! Traditional yet with a modern vibe. Very Kathy Doughty (of Material Obsession) if I might venture a comparison. I just adore this quilt! I would never have thought to use that blue floral or the black check and yet it is absolute perfection. This is what I love about blogging. It is so inspirational. Thanks for sharing. This is simply wonderful in every single way!! !